In 1971, Soviet geologists punched through the crust of the Karakum Desert about seven kilometers (four miles) outside of the little village of Derweze, Turkmenistan, population 350. They were searching for natural gas—and did they ever find it! The drilling rig hit a large natural cavern filled with gas, which promptly collapsed, taking down the rig and possibly some of the geologists as well, though those records remain sealed. A crater approximately 70 meters (230 feet) wide and 20 meters (65.5 feet) deep formed, and began spewing methane into the atmosphere. Even in that era, before concerns about methane's role in climate change and its potency as a greenhouse gas had hit world consciousness, it seemed like a bad idea to have poisonous gas leaking from the ground in huge quantities near a village. The Soviet scientists decided that their best option was to burn off the gas by lighting the crater on fire. They accomplished that task by tossing a grenade into the hole, anticipating that the fuel would run out within the week. That was more than four decades ago, and the crater is still burning. Its glow is visible from Derweze each night. 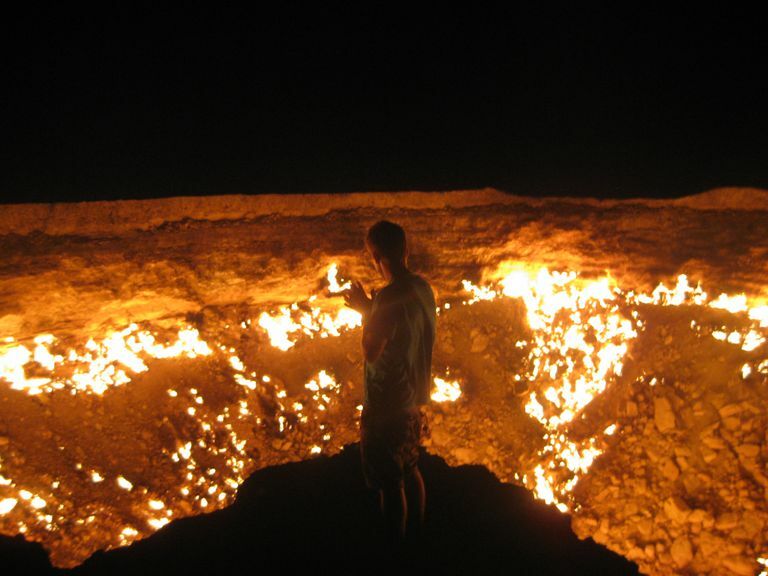 Fittingly, the name "Derweze" means "gate" in the Turkmen language, so locals have dubbed the burning crater the "Gate to Hell." Although it is a slow-burning ecological disaster, the crater has also become one of Turkmenistan's few tourist attractions, drawing adventurous souls out into the Karakum, where summer temperatures can hit 50ºC (122ºF) without any help from the Derweze fire. Despite the Derweze Door to Hell's potential as a tourist site, Turkmen President Kurbanguly Berdymukhamedov issued orders for local officials to find a way to put out the fire, after his 2010 visit to the crater. The president expressed fears that the fire would draw gas from other nearby drilling sites, damaging Turkmenistan's vital energy exports as the country exports natural gas to Europe, Russia, China, India, and Pakistan. Turkmenistan produced 1.6 trillion cubic feet of natural gas in 2010 and its Ministry of Oil, Gas, and Mineral Resources published a goal of reaching 8.1 trillion cubic feet by 2030. Impressive though it looks, the Gates of Hell at Derweze seems unlikely to make much of a dent in those numbers. The Gates of Hell isn't the only Middle Eastern reserve of natural gas that's been on fire in recent years. In neighboring Iraq, the Baba Gurgur oil field and its gas flame have been burning for over 2,500 years. Natural gas deposits and volcanic activity alike cause these anomalies near earth's surface, especially cropping up along fault lines and in areas rich in other natural gasses. The Burning Mountain of Australia has a layer of coal seam fire perpetually steaming under the surface. In Azerbaijan, another burning mountain, Yanar Dag has been reportedly burning since a sheep farmer accidentally set this Caspian Sea gas deposit ablaze sometime in the 1950s.